Fortuitous began her 2015 racing campaign on Saturday. As with all racing, there were high points and low points. The wind was up as we exited the creek, and after setting the leeward mark we tucked in a reef. As we waited for the committee boat to get situated, however, things quieted down, the whitecaps subsided, and we decided to shake out the demon. 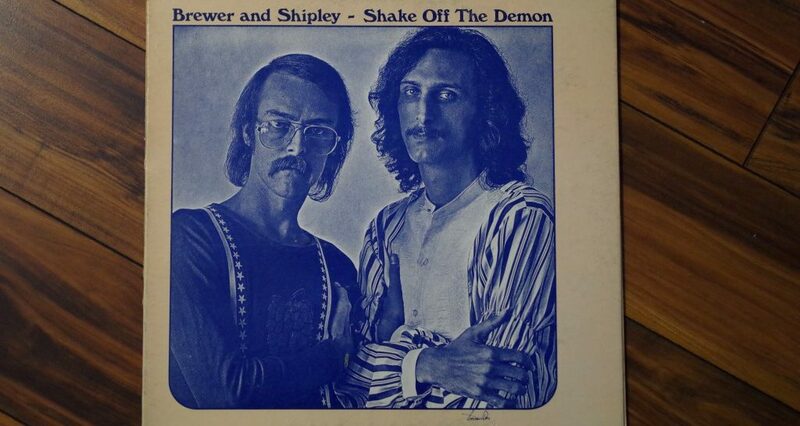 “Shake out the Demon,” by the way, is what Jen and I have always called “shaking out a reef,” in reference to the 1971 Brewer and Shipley album Shake Off The Demon. Surprisingly, I could not find a hi-res image of the album cover, so here you go, Internet, from our personal collection: I’ve added the photo to the top of this page. Since opening day is officially the “Practice Race” in the Windjammers’ racing calendar, it was determined that we’d have a short windward-leeward course and run several discrete races. This would give everyone a chance to practice starts, and potentially allow for boats to recover from any single grievous error. …which we greatly appreciated, since we utterly botched the first race. I was nowhere near the start, and things got worse from there. I was pinching to try to catch up (which never works), I don’t think I read the course correctly as the wind started to clock around to the east, and while I was focused on losing, I bickered with Jen about basically everything until she lobbed a beverage in my general direction. We came in appropriately last. I tucked up behind the committee boat and heaved-to so that we could collect ourselves. Sailor Steve and I enjoyed a beer, I made amends with Jen, and as a team, we sorted out some of the details on where everyone would go during tacks, etc. We had this down by the end of last year, but after the hard reboot of a long off-season, we didn’t just pick up where we’d left off as I’d imagined. The sailing manuals will tell you that heaving-to is a great tactic for calming things down during a storm, but I think that it might apply to emotional turbulence as well. With our renewed outlook and blood alcohol levels, the second race went much more smoothly, although we still required some luck. During the starting sequence Island Breeze tacked in front of Stormy, Stormy elected to go for the line with them, and they both wound up being over early. They both got out of our way as we barreled over the line behind them, on time, with a good head of steam. I think Sunset had to jog down the line a bit to avoid being over early, so she was initially slow, but she’s a bigger, faster boat and they were shortly in the lead. I’m not sure whether Lorelei even started the second race, but they didn’t seem to be a factor and I know for sure that they didn’t finish. The wind had clocked around so much that the course was no longer windward-leeward and we could reach straight to the marks in both directions. Without a need to tack upwind, Sailor Steve could work the jib solo and I put Jen on the main. She hasn’t had many opportunities to trim a mainsail in her sailing career, so I gave her a quick rundown, set the traveler for her, and let her trim to the puffs as I sailed straight for the marks. I think she enjoyed getting to try something new, and we were really fast with everyone focused on one thing. We couldn’t catch up to Sunset, but we successfully held off Stormy and Island Breeze and finished second on actual time. There was a discrepancy in the corrected time that I haven’t quite figured out yet, so I’m not sure where we wound up based on the handicaps, but we were probably second or third. Dale immediately pointed Sunset directly at us. Game on. Riding the high from our triumphant recovery in Race 2, Fortuitous and her crew were one machine as the boats circled each other like prize fighters during the starting sequence. There were feints and parries in the form of endless tacks and jibes as we jockeyed for position. I put Sailor Steve through the ringer as we did 360s and sweeping turns through every point of sail to keep from getting pinned to windward. I was going to compare it to a biplane-era dogfight, but the reality is that it was more like a real sailboat race—like the America’s Cup before the America’s Cup became silly; like pre-meltdown Dennis Conner dueling with the Australian du jour. I was literally laughing through the chaos as the brawl unfolded at 4 knots. As the clock wound down, neither of us had managed to gain significant advantage, and we crossed the line side-by-side at speed. Sunset is an inherently faster boat and she soon pulled away, but we stayed right on her stern through the rest of the race. We settled in to our rhythm again, sailed mistake-free, and did not let Sunset walk away from us. She took line honors, but Fortuitous took her first ever 1st Place on corrected time. After the race, we were notified that the Race Committee, in their haste to get set up, had not brought beer. Fortunately, they brought their beer net. We sailed past on just the main, close enough to deliver our reserve supply of PBR. Remember to always tip your RC. We then sailed over to pick up the leeward mark, which the crew hauled in like experienced Bearing Sea crab fishermen. Saturday encompassed the entire range of racing emotions, and I was glad that the format allowed us to recover from our initial fiasco. I can’t overstate how cool the start of Race 3 was for me. I’m not sure I could even articulate exactly what happened, but time slowed down like it does when you’re in a car accident, and the crew rolled with whatever craziness I was invoking with aplomb. Thanks again to Sailor Steve and Jen for being crew, and congratulations on going from worst to first in one afternoon.